As a member of the ARCHICAD Best Practices 2020 Course, on this page you may purchase MasterTemplate for only $200 (normally $397). MasterTemplate is a fantastic complement to the course, since it embeds my optimized best practices methods into the project file. It will make it easier for you to start projects, run them more efficiently, and produce higher quality work on a consistent basis. If you have any questions, or need support at any time, simply email me at support@bobrow.com - I'm always happy to help. NOTE: This is a private, members-only offer. You won't find this discount available publicly. For more info on MasterTemplate, you may review the materials below or visit the MasterTemplate website. Do you often feel like you're fighting ArchiCAD? Tired of spending too much time playing with settings to make things look right? Is meeting your deadlines a DRAMA? MasterTemplate is a robust customizable office standard for ArchiCAD that embeds Best Practices methods into the project structure. Created by two ArchiCAD masters with over 50 years of combined experience using and teaching the program, it is a catalyst that will jump you up several levels in terms of organizational efficiency, saving you immense amounts of time while supporting you to produce higher quality work. Continually needing to “play with the settings” to make things look right? Frequently having to redo the same setup tasks in every project? Getting inconsistent results and graphic standards with each project? Losing track of information within the project because the organization is haphazard? Always rushing to meet your deadlines, while rarely having time to optimize your setup? Often feeling like you’re fighting with ArchiCAD, rather than having it be your trusted assistant? When you have a really good office template that embeds Best Practices methods into the file structure, you’ll be able to minimize much of those tedious tasks, and put the time to better use. You won’t have to redo the same things over and over again. They’ll already be in the project file, ready to access. MasterTemplate is the most robust project template commercially available – a customizable solution that will make a huge difference in how you work in ArchiCAD. With over 1,000 licensed users, it is the most popular independent ArchiCAD template system in the world. 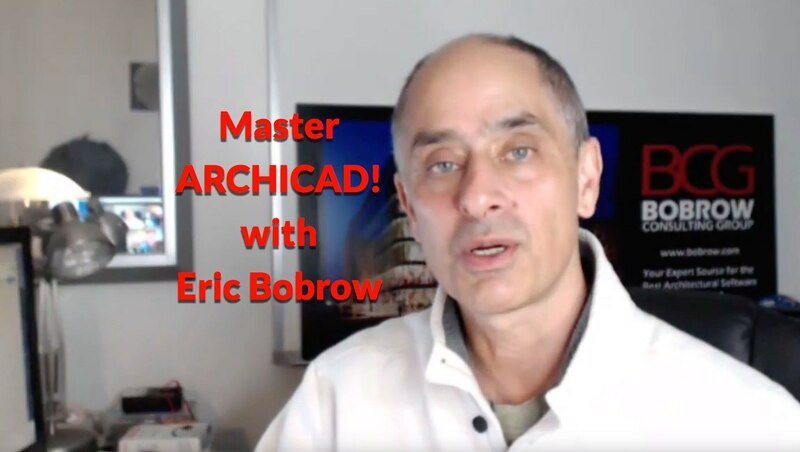 MasterTemplate is the culmination of hundreds of hours of development by two ArchiCAD Masters with a total of over 40 years of experience: Eric Bobrow (former reseller, trainer, and tech support expert) and Scott Bulmer (architect, consultant and developer). The template structure is set up with Best Practices concepts in mind, enabling users like you to jump several levels in efficiency and productivity in a very short time. This is the tool to learn ArchiCAD the way it must be.… this is the first time I realized how I can create my office standards in an efficient way… I think the benefit of using MasterTemplate is similar to moving from CAD to ArchiCAD. This is the best money I have ever spent in software or software education. Well Done!!! MasterTemplate is available in both international metric and U.S. imperial versions, for each edition of ArchiCAD from 10 through 22 as well as Start Edition. It is provided as an electronic download through this website, complete with an extensive manual of practice that will guide you as you customize it to suit your own preferences and the requirements of your office. In addition, video tutorials are available that show you how to install the template, add your own logo and other company information, and get started on a new project. An online members forum is there for posting questions and getting expert assistance, and free email support and coaching is available as well. A sample file is supplied that shows the template in use on a project, which in and of itself is an amazing educational tool. Many users have commented that only after studying the sample project did they finally understand how all the pieces of ArchiCAD fit together. You can examine the model in detail, and “reverse-engineer” the drawings to see how various effects were accomplished. I personally guarantee your complete satisfaction with MasterTemplate. Try it out on as many projects as you like for a full 90 days, and if you’re not completely thrilled with the results, we’ll buy it back from you. If you have a problem or question, you’ll get a detailed, personal response from myself or one of our support team. You’re never going to feel like you’re going it alone. Once you get MasterTemplate, you become part of our community of users focused on mastering ArchiCAD – and we’ll do our best to help you succeed. Go ahead – get started with MasterTemplate now. You’ll be glad you did. I guarantee it! We could easily justify a price of $1,000 or more based on the hours and hours of work you’ll save. However, we’ve decided to make MasterTemplate an affordable purchase for ArchiCAD users like you. and follow through the standard shopping cart process. Wish I’d found you 2 years ago instead of putting up with my own half-baked template. MasterTemplate is everything I’ve been looking for.